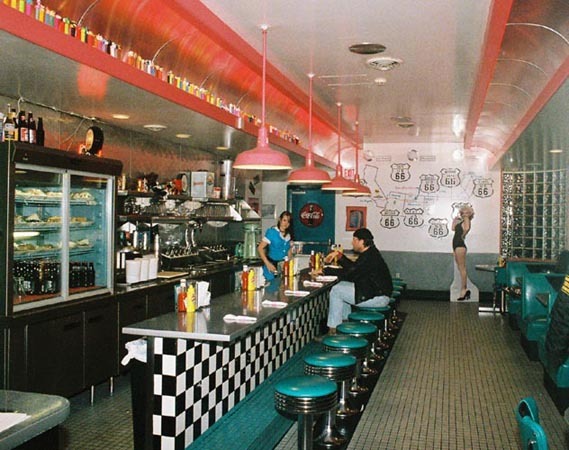 Though Elvis Presley left the building 30 years ago today, his idealized form lingers - pervasive and sometimes too profuse - in many of our roadside diners and such. 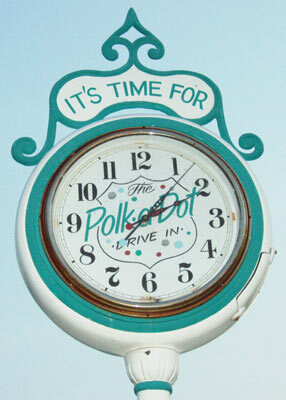 Nowhere will you find more Elvae per square foot (E/ft²) than the Polk-a-Dot drive-in in Braidwood, Illinois. 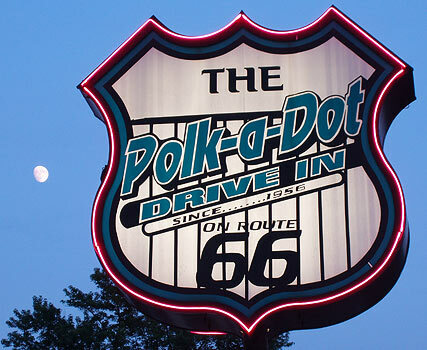 The Polk-a-Dot is a fine little place to stop for a burger and a pop, and I do recommend it. It advertises that it has been here since 1956, and the outside drive-in part looks it. According to their website the business started in a school bus painted in rainbow polka dots which had a very small kitchen inside. The grounds are decked out with some nice bits. 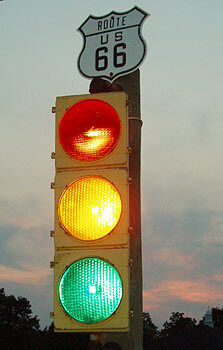 The place is right along Route 66. And, it was popular with the locals when we were there in July of last year. In fact, it was one of the locals that, noticing we were tourists (ya think the EZ Guide and the cameras gave us away? 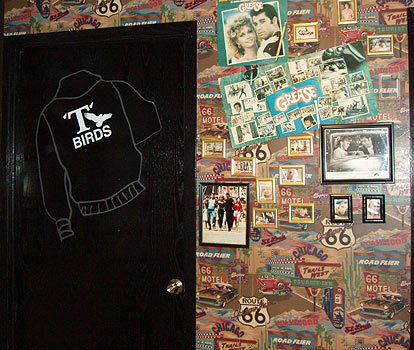 ), insisted we see the women's restroom, behind the "Pink Ladies" door. Pink Ladies is a "Grease" reference, by the way; I had to be told of that. My lovely significant other performed the mission of checking out the ladies' loo, and took along a camera. The large picture in this frame looks at the toilet. I really should have called this post "King in the throne room." I would think this might make some women nervous. Wanna guess what's in the men's restroom? She's outside too, along with James Dean and Betty Boop. 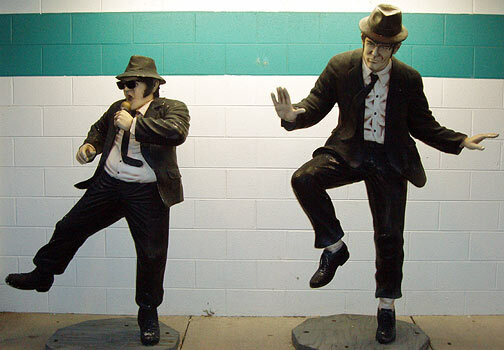 Now, The Blues Brothers I can understand. Quite a bit of the movie was filmed in these parts, so they have local significance. But here's my misgiving. 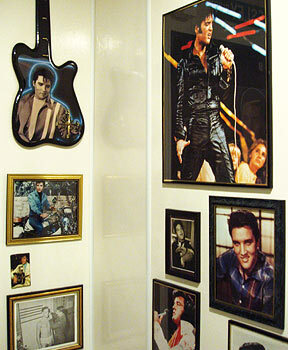 Don't get me wrong, I have nothing against Elvis, Marilyn or the rest of those ill-fated icons. I just think they're a bit overdone, especially in places that don't need to borrow from the Presley charisma bank in order to be cool, but do so anyway to the dilution of their innate character. I wish that some of these places, particularly the genuinely older ones, showed off more of their history. In the case of the Polk-a-Dot, what about a few photos of that school bus? 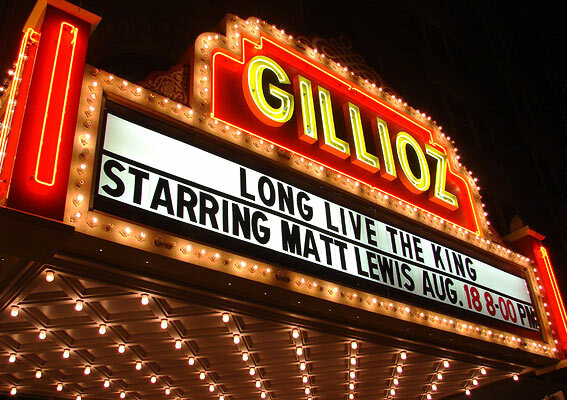 Some places, like the Gillioz Theatre in Springfield Missouri on Route 66, have a probable genuine connection to Presley. According to their website, on May 16 of 1956 Elvis was spotted at the Gillioz Theatre after sneaking away between his matinee and evening performances at the nearby Shrine Mosque. 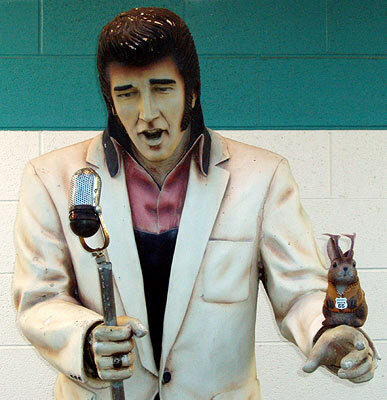 You can see an Elvis-inspired performance by Matt Lewis there this weekend, by the way. Although it's another place way too decked out in nostalgia stuff, The Summit Inn at Cajon Pass along California Route 66 has earned the king, in that he was reportedly actually there...for a minute or so, anyway. 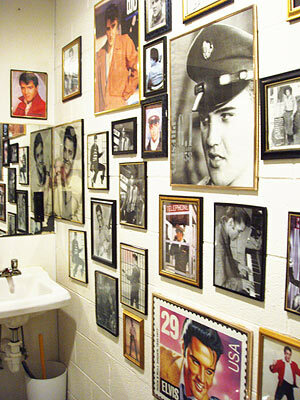 "Elvis only came in here one time. I started to wait on him and we had the juke box right in the center. When he came in he just stopped to look at the juke box first and put his stuff on the table and then he didn’t see any of his records on there. I don’t know why ’cause we always had ’em on there, but I think the Beatles were very popular then. He got mad and left." 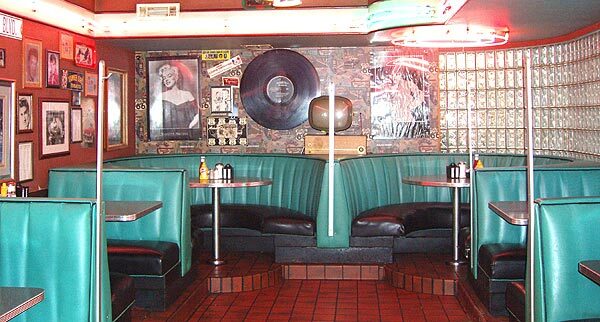 Tulsa's recently demolished Metro Diner was not even built before Elvis died, but featured he and his cohorts as part of its decor. A bust of Elvis hangs out at Bradbury-Bishop Deli in Webb City, Missouri. 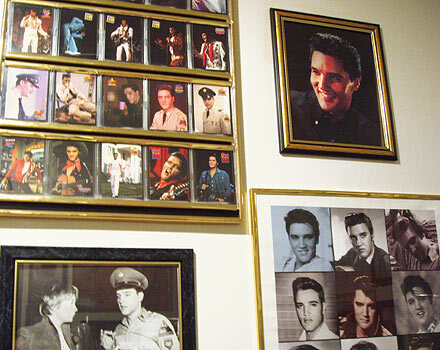 They actually have quite a bit of Elvis/Marilyn/James stuff. 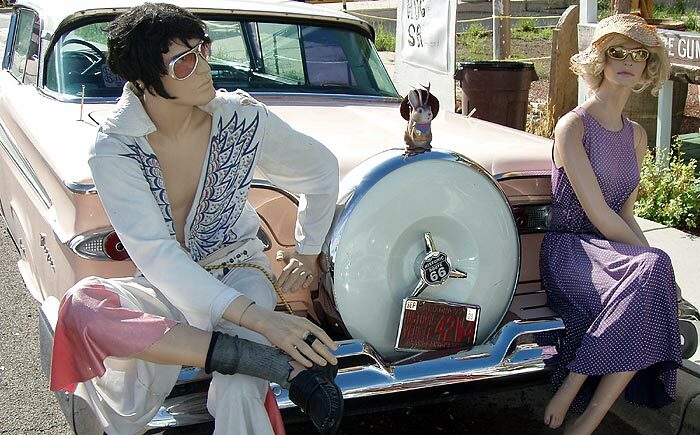 Mannequin Elvis looks comfortable in Seligman, Arizona. There are always Elvae on Hollywood Boulevard. 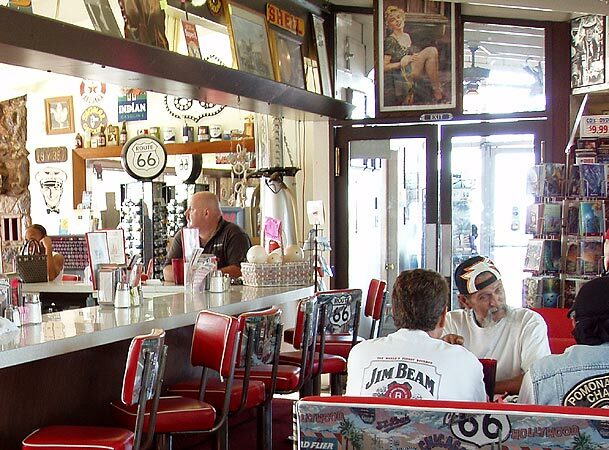 Albuquerque's Route 66 Diner is another post-Elvis-mortum establishment that's fully retroed. Note the Marilyn standee. And that brings me to a suggestion for anyone starting or reviving a business, especially one along a tourist corridor like Route 66. How about a Marilyn Moratorium - or a temporary evading of Elvis? 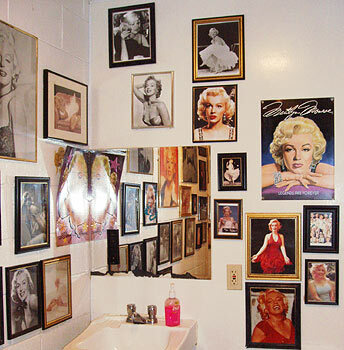 Be more individualistic and creative; acknowledge the 50's and that period's icons if you're going for nostalgia, but make sure the heritage of your own unique area shines through. I can understand the use of stock posters if a place has no history, like the canned decor at the suburban Applebees, above. Examples of this abound. 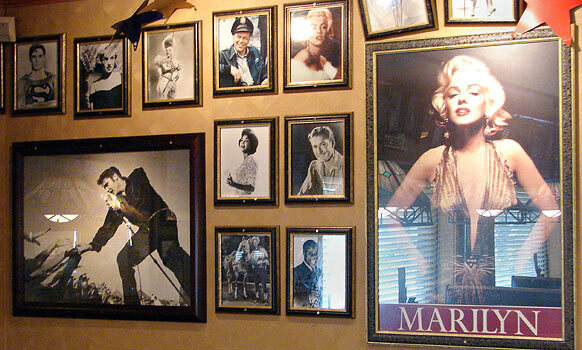 How many diners have you seen that featured the ubiquitous posters of Elvis, Marilyn and James Dean hanging around some cool location? In reality, would they really get along? I doubt it. It' not really them, anyway...more of a cafeteria perception of their personalities. The most common of these posters is Boulevard of Broken Dreams by Gottfried Helnwein, a take-off of the Edward Hopper painting, Nighthawks. Incidentally, if you want to kick off or conclude a Route 66 trip with a great piece of art, Hopper's Nighhawks is on display at the Art Institute of Chicago near the eastern end of the route. 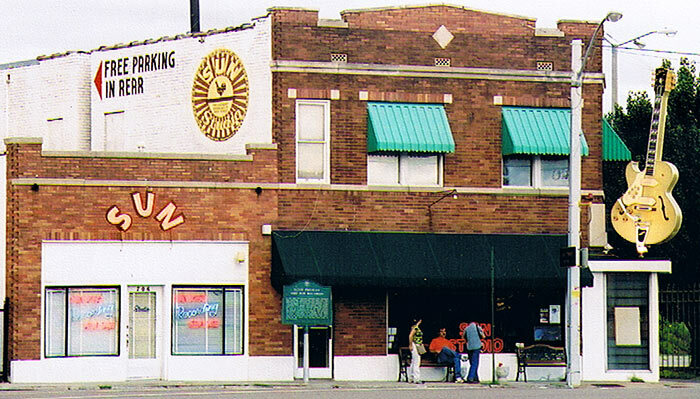 I can't finish without throwing in a sign pertinent to Elvis - Sun Records in Memphis, shot in early September of 2001. 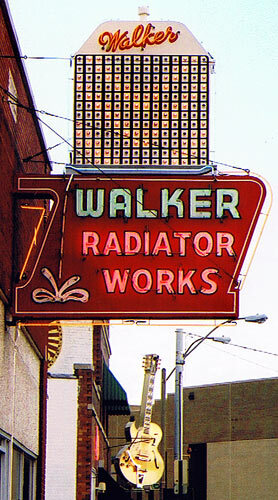 And if you're in the neighborhood, check out the sign for Walker Radiator Works. I didn't see it at night, but you can tell the lights chase down the radiator and the neon "drips". 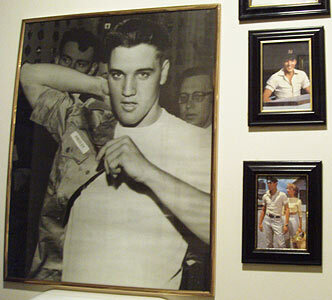 Twenty-five or so years ago at the Virginia Street flea market in Joplin, Missouri, I saw a black velvet wall hanging which portrayed the ghost of Elvis pushing a man out of harm's way at a truck stop. It appeared to be the black velvet sequel to "Jesus of the Truckers", a similar hanging with a much older savior. I was thinking "who buys this stuff? ", when a man beside me turned to a women - his wife I presume - and said in a choked voice: "He was the King, Martha." About 20 years ago I was travelling with Patsy Terrell when we stopped at an Elvis-themed cafe and gift shop near St. Louis, Missouri. 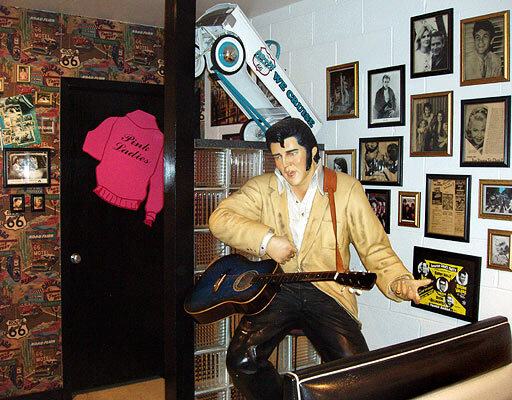 It was affiliated with the Elvis is Alive Museum. 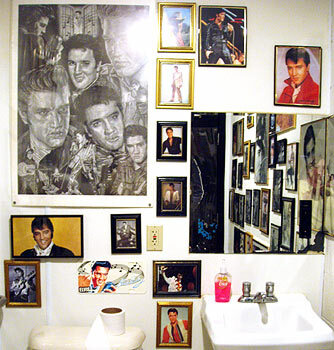 The proprietor, Bill Beeny, has long contended that Elvis is alive and will talk your ear off telling you of secret FBI files, a fake funeral and even a fake Lisa Marie (the real one is in Sweeden). Bill Beeny: "How are you today?" 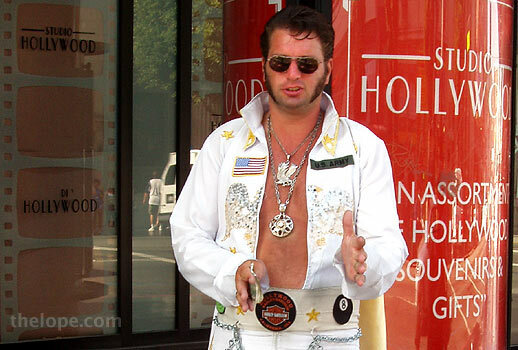 newcomer: "Elvis is alive and well." This repeated several times with his regulars as Patsy and I tried to avoid eye contact with each other lest we lose our composure. I bet those guys would love the Polk-a-Dot.